Posted by on Friday, January 9, 2015 in Uncategorized. 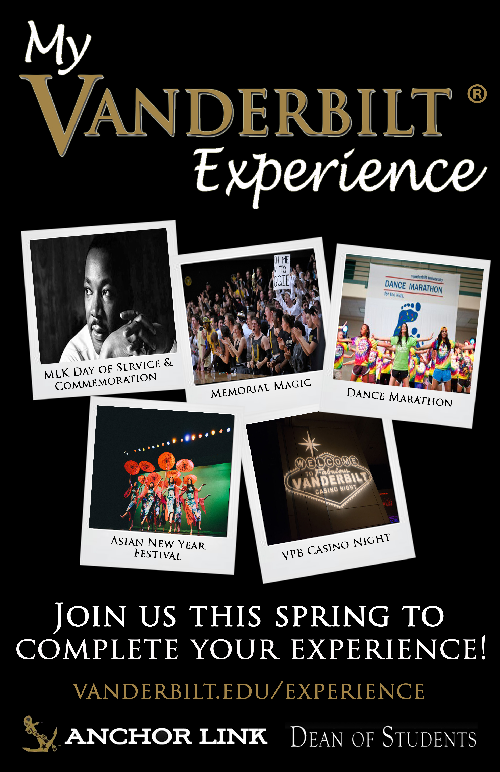 Are you looking for a new way to experience Vanderbilt? Do you want opportunities for intentional engagement outside of the classroom? My Vanderbilt Experience is a year-long program that provides students a virtual framework for co-curricular engagement. 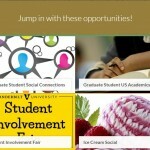 Managed through Anchor Link, My Vanderbilt Experience offers a menu of events and activities for students to participate in, across nine tracks, and connected to specific learning outcomes. The tracks include: Arts, Critical Dialogue, Cultural Awareness, Culture of Care, Dores After Dark, Health & Wellness, Leadership & Personal Development, School Spirit, and Service & Civic Engagement. Participation is recorded through card swiped attendance at eligible events. 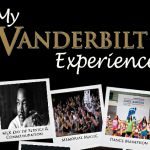 When a student participates in a My Vanderbilt Experience event, their progress will automatically be displayed in the My Co-Curricular Programs dashboard of their Anchor Link home page. To complete the program, students need to participate in at least two items in each track. Throughout the year, students who complete individual tracks will also be eligible for drawings to receive special experiences and prizes. It’s not too late to participate! Check out the calendar of events here!